A blood moon — the longest total lunar eclipse of the 21st century — will occur on the night of July 27 and the morning of July 28. The lunar eclipse is set to last for 1 hour and 43 minutes. The event will only be visible in the Eastern Hemisphere, though others can watch via livestream. Scroll down to see when to look up. 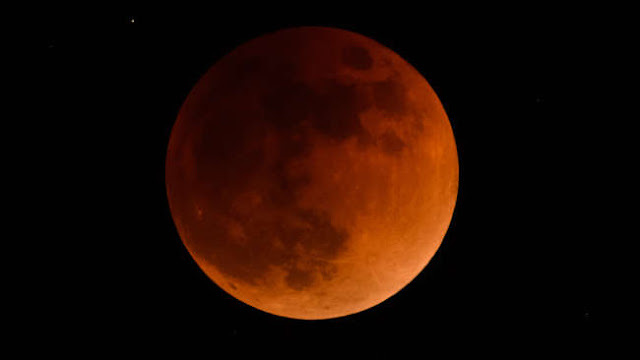 On the night of July 27 and the early morning hours of July 28, sky-watchers in the Eastern Hemisphere will be treated to the longest lunar eclipse of the 21st century. Astronomers expect the total eclipse to last for an hour and 43 minutes, with the entire event, including the partial eclipse, lasting 3 hours and 55 minutes. A lunar eclipse occurs when the sun, Earth, and moon are aligned, and the moon's orbit brings it directly into Earth's shadow. Earth's shadow, known as the umbra, gives the moon a reddish "blood moon" color due to the way the Earth's atmosphere refracts the sun's light. The total eclipse will only be visible to parts of Africa, the Middle East, Russia, and India, while some of the regions to the east and west will be able to see a partial eclipse. The eclipse won't be visible to viewers in the US and Canada, but you can watch the eclipse live on July 27. This map shows who will get to see the event. All of the countries in the dark red area in center will get to see the entire eclipse event, from start to finish. Moving eastward or westward, those areas will see less and less of the total, partial, and penumbral eclipse. The eclipse will begin at 7:30 p.m. UTC, or Coordinated Universal Time, and end at 9:13 p.m. UTC. The peak of the total eclipse will occur at 8:22 p.m. UTC. UTC is the most precise time kept by atomic clocks around the world, and is frequently used by scientists. To convert UTC to your local time zone, EarthSky offers a handy guide. That'll tell you exactly when to look up to check out the eclipse. If you prefer to avoid doing any math, you can also enter in your city here. Read next on Business Insider: What living on Earth would be like without the moon.